Hi, I’ve been fostering rescue dogs for over two years now. As you can imagine I’ve had all sorts of poorly socialised and fear aggressive dogs. All of my foster dogs have been welcomed at Enve Canine Services dog training classes and all have massively improved which makes them so much easier to rehome. 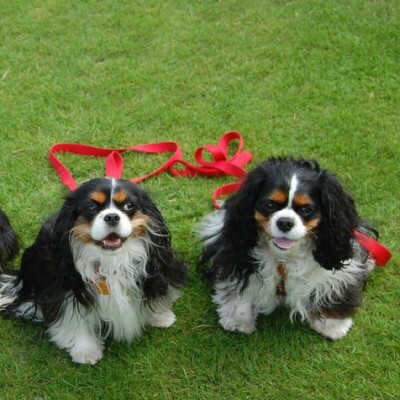 A great big ‘thank you’ to all at Enve for helping all my dogs to become happier and more balanced. 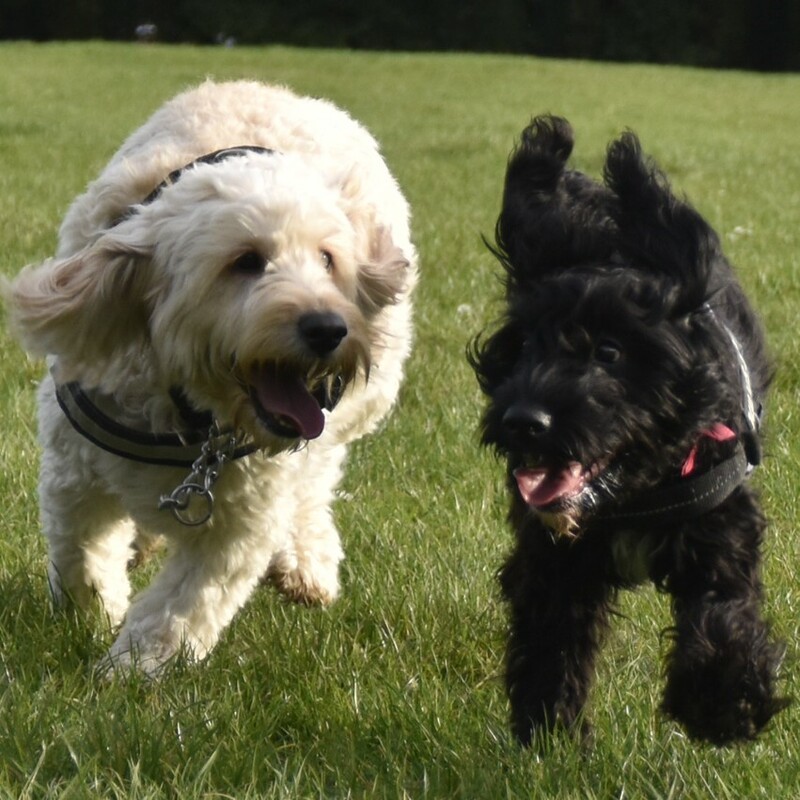 For some time I have been taking my lovable but very large and excitable Labradoodle to Enve's training sessions. 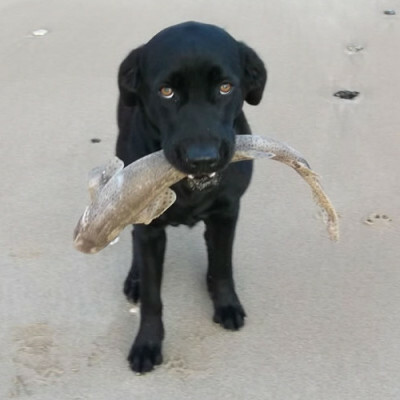 I cannot praise the trainers enough, they have provided me with many ideas and much support which has enabled me to manage my dog and see him progress into a much better behaved dog. 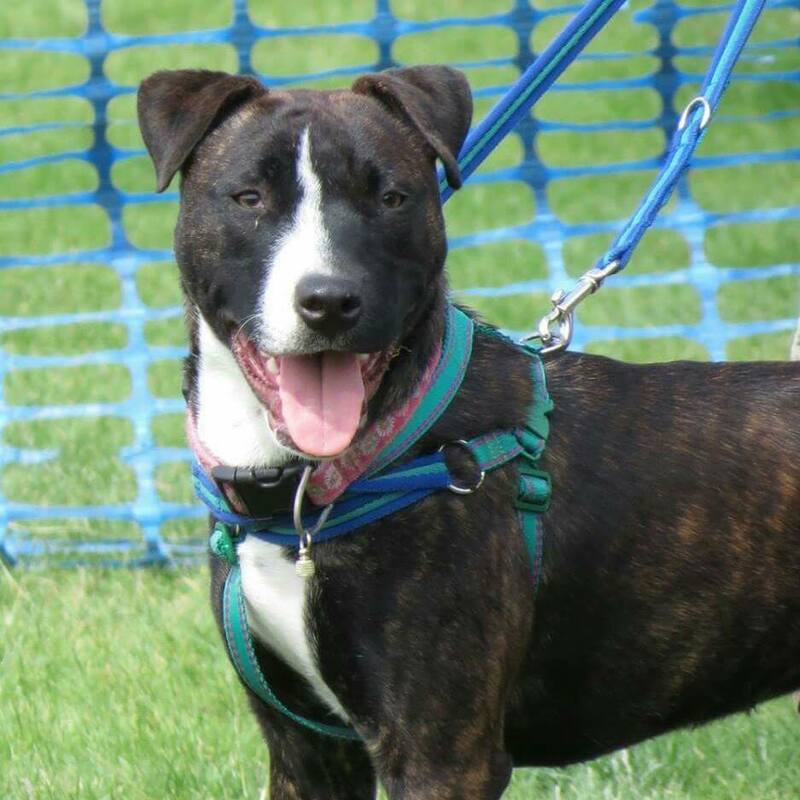 He now walks beautifully on the lead, responds immediately to a recall, can be left for reasonable amounts of time and enjoys playing with other dogs without any sign of aggression. All this has been achieved in a supportive, friendly environment enjoyed by both dogs and handlers. Much pleasant banter and humour is evident in every session and the hour of training passes so quickly for us all. 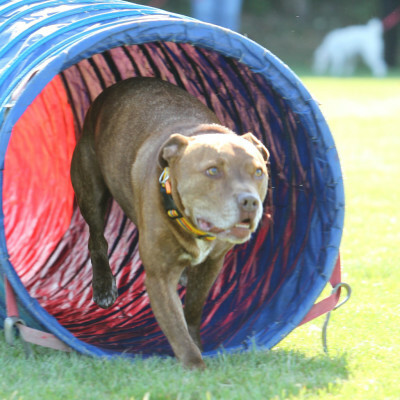 If you want help training your dog, whatever it's age I cannot recommend Enve Canine enough. I no longer really need the weekly training sessions but I continue as both my dog and I get so much pleasure from them! 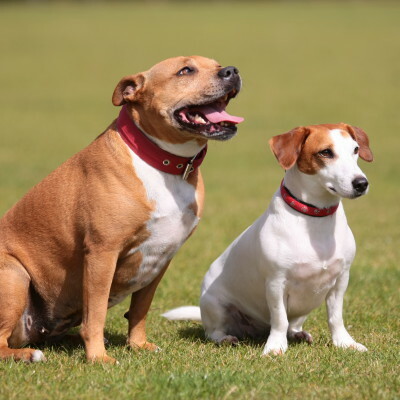 We cannot praise you enough for the improvement shown in our two dogs, Dixie (SBT) & Ruby (Jack Russell). Their improved response and behaviour has exceeded all expectations. The great thing is that while we enjoy the atmosphere the dogs obviously enjoy the training, they seem to sense that we are setting out for the class on a Saturday and are raring to go! Even when their training is regarded as complete, we will still be coming along. Our little dogs really look forward to their classes on a Sunday and get excited at the mention we are going. They are enjoying learning the different skills taught to them by the friendly, but firm instructors, and working towards their Gold standard. Keep up the good work Ve, the classes are really fun and it is great to see the girls achieving different things and making new friends. We didn’t take Tula to puppy classes – She learnt really quickly and easily. It was only later that we realised our mistake. We thought we had a perfectly behaved dog but it started going wrong at about 6 months, she got nervous of people; barking and charging at them and as a big dog she could be quite intimidating. No stranger could go near her and we realised that we had started looking for escape routes when out walking to avoid anyone we came across. Whilst perfectly obedient for us she was an accident waiting to happen with a stranger. We took her along to the classes to have a look but her behaviour was just as embarrassing, however Ve and all the handlers were kind and welcoming and could see that despite her noise and actions that she didn’t actually want to bite anyone and that we could work with her. Over the next 6 weeks we gradually introduced her to the class and she started to grow in confidence. 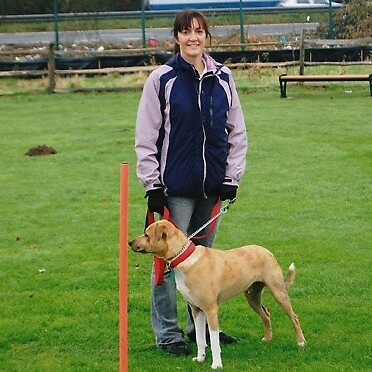 We continued for subsequent courses and whilst she remains wary of strangers she is now happy to be stroked and examined by other people – as well as gaining her Silver obedience award. Poppy & Biscuit love training with Enve. The trainers are excellent and are always there to help with any questions or problems that you may encounter. The techniques learnt in puppy class with Emma have been so useful including the initial door manners and how to recall your puppy without turning it into a game. Peter is great with the junior dogs and always manages a laugh when he wanders round in his 'best white frock' so as not to allow the dogs to jump up and ruin it! ......we wouldn't want that would we? Would definitely recommend Enve Canine Services for all your dog training needs. 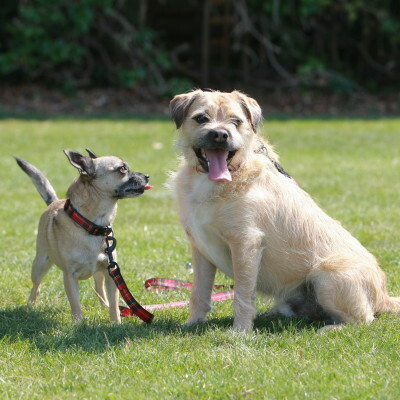 Paddy is a high energy Terrier Cross now aged four. He has been a going to the Enve Canine Services Minster Group since 18th months and in that time has progressed to the gold class. Being disabled having had polio I have been able to do most of the training (maybe slower) with my son taking the agility part. It is important to me to have a dog that returns when called and walks with me without pulling. 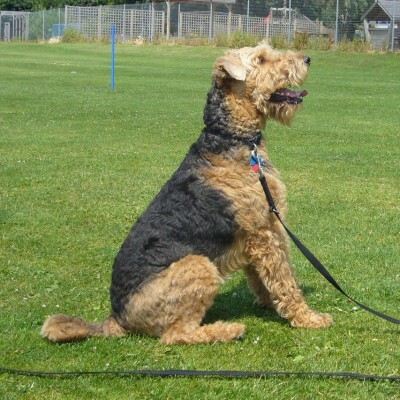 The classes are fun, the trainers and fellow dog owners friendly. Paddy having pug in him whinges as soon as we turn onto the estate he so looks forward to going. He also can’t wait to meet each trainer before (most times) settling down to some training. 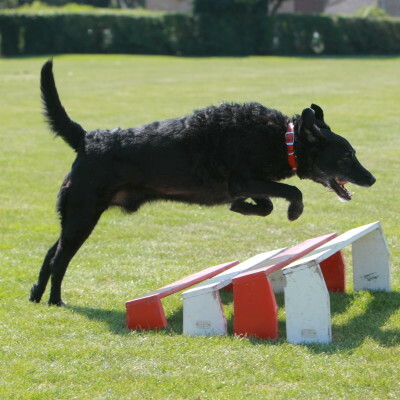 Agility for him is his highlight speeding around the course which is set out so as not to hurt any size or age dog. Charles though not training is a rescue Chihuahua who has benefited from being among all the dogs. Whilst able we will keep returning as it becomes not just training but a place to make and meet friends. Hi, I’m Tug a rescued Staffie and I just want to tell you how much I love my Saturday mornings at Enve Canine Services group training classes. I’ve been going for just over a year now and have made so many doggy friends. My mum is very proud of my bronze and silver certificates and she’s always telling everyone how clever I’ve become....it’s just a shame that no one’s training her to keep away from the tea & biscuits & to stop chatting!! I rehomed 7 year old Billy 18 months ago and was told that he “wasn’t very keen on male dogs”, this was the understatement of the century – it applied to all dogs. He was impossible to walk, as soon as he caught sight of another dog he turned into a furious bundle of barking, snarling fur, slipping both his collar and harness trying to get at them. I contacted Enve within days and was told to bring him along to the Minster classes. On arrival, despite being at the field perimeter, he was so bad one of the instructors had to leave the class she was teaching in order to try and calm him down. Emma and Ve immediately ascertained that his problems were down to anxiety and not aggression. Within a couple of weeks he had calmed down significantly. The highlight of Billy’s week now is ‘School’, which he absolutely adores, he treats it as a social event and has many lady friends! Never think that you can’t train an older dog. The dog I thought that I would never be able to walk off the lead now happily runs free with other dogs in the park. I can’t recommend Enve Canine Services highly enough. All the trainers are brilliant, so kind and understanding, changing a very stressed unhappy dog and owner into a very happy duo. I first contacted Enve Canine Services through Facebook and was very impressed by the prompt reply on the same day. 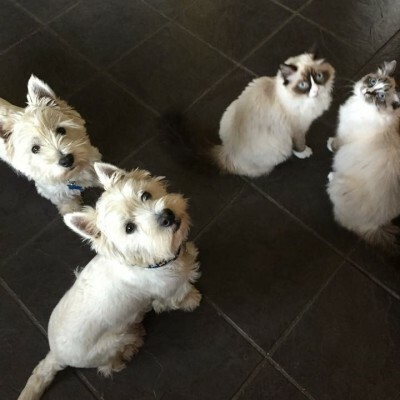 I wanted some help with my two Westies who were then only 1 year old (Hamish) and 6 months old (Archie), mainly with training issues and introducing them to our two kittens. So Emma came round to my house and spent an hour with us all as a family with lots of advice and demos on training and how we should treat two dogs such as always greeting and giving treats to the older one first. She had them trained within the hour! But Emma didn't just leave us to it, the after care has been lovely too - we keep in regular contact with updates on how they've been. We took the boys along to the group puppy classes at Minster and we have since had two further 1:1 sessions - one to advise on adolescent issues including excessive urination and possessiveness and our favourite by far when she met us at the beach for the boys first time off the lead. 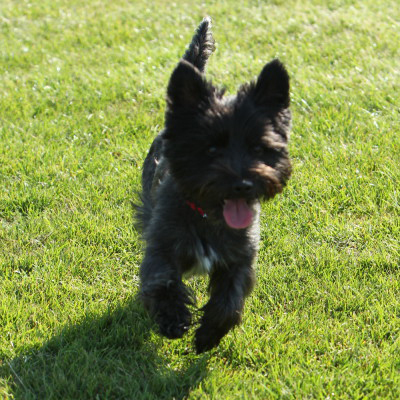 Emma has given us so much advice and confidence in owning a dog or two! To be able to have the 1:1 option has been great for us all. The best thing about the training is we enjoy it, our dog Paddy enjoys it and we all are being trained at the same time making progress each week. This is thanks to Emma, Ve and the team who have always got time to answer questions and provide good advice when needed.